French baguette instead of an English muffin, and smoked salmon instead of ham. This is some next level eggs Benedict action going right here. Why change the classic? To inspire some creativity. 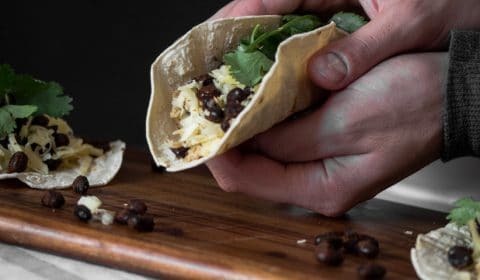 I want this blog to be about easy and quick recipes, but I also want to incorporate recipes that aren’t necessarily difficult, but recipes that will improve your cooking skills, your understanding of how to use ingredients and gaining more knowledge when it comes to cooking methods. And that’s what this recipe is all about. Now when it comes to the process of making this dish, there are 2 key components. Poaching the egg and making the hollandaise sauce. How I like to poach an egg? Fresh Eggs – When an egg is fresh, it’s texture is more solid. When it’s not so fresh, the texture of the egg is very liquidy and thin. So you can imagine when placing an egg that has passed its expiry date in hot bubbling water, the egg won’t stay together very well, in fact, you may even notice that the egg white goes all cloudy in the water. So when making poached eggs, try not to use them when they’re so close to expiry date, and make sure you look at the dates on the packet when you buy them so you can get the freshest eggs possible. Vinegar – Adding vinegar to the water will help the egg whites set and solidify faster whilst they are cooking. Another example of this is when meringue recipes tell you to add crème of tartar (which is an acidic powder). This is because the acid helps to stabilise the egg white. Now adding a bit of vinegar to your simmering water is fine, but if you add too much, your poaches eggs will just smell and taste acidic. And I don’t want you to rely on this too much, fresh eggs your technique and your sense of care are much more important factors in my opinion when making poached eggs, but adding the vinegar is definitely something that can help you. Crack the egg into a ramekin or a container before you add it to your water –This is for a couple of simple reasons, to make sure you don’t end up splitting the yolk as you add it to your water. And this also gives you the chance to check if any shell needs to be removed before adding it to the hot water. 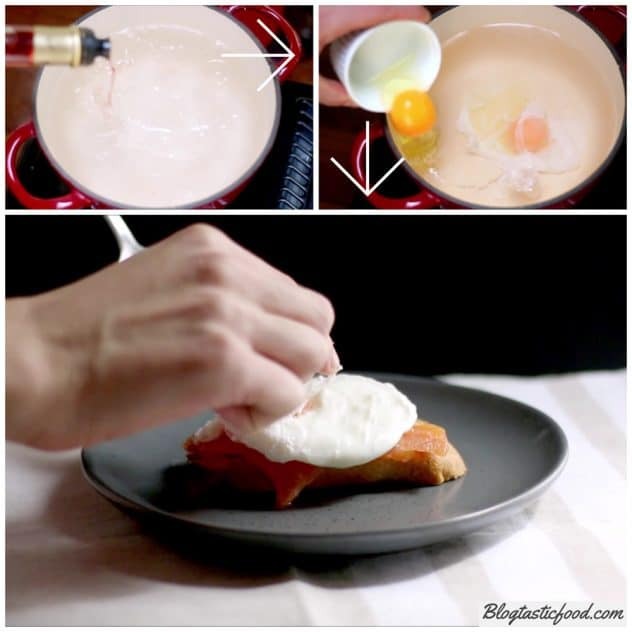 And you don’t just have to do this with poached eggs. You can do it when frying eggs, scrambling eggs, making omelettes etc. to ensure good, consistent quality control. Gentle boil –In fact, forget the word boil. You want the water to be at a very gentle simmer. If your water is rapidly boiling when you add your delicate egg, well, of course, the egg is going to get annihilated. So you want to simmer the egg nice and gently, and make sure it doesn’t stick to the sides or the bottom of the pot. Learning how to poach an egg is a fantastic way of allowing you to understand heat control and timing when cooking an ingredient. So if your poached egg screws up the first time, don’t worry, keep trying and you’ll get there. Heat control –This is very important because we are trying to cook egg content without scrambling it. And that requires low heat. 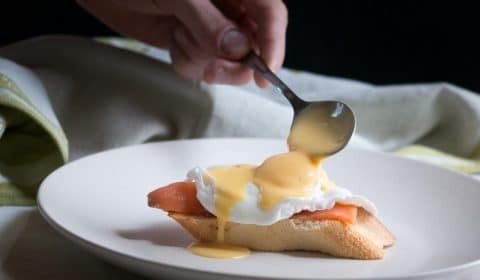 Now hollandaise sauce is usually flavoured with a vinegar reduction (boiling and reducing the vinegar in aromatics to give it a stronger and more intense flavour). And if you want to do that, go right ahead. 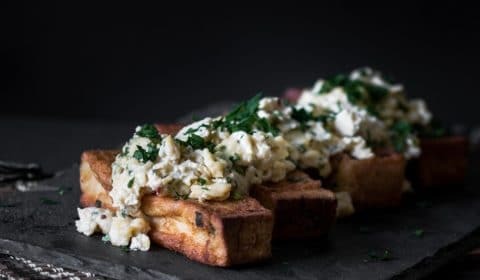 However, in this recipe, I just chose to add some fresh lemon juice instead because if you’ve never made hollandaise before, I just want the cooking process to be a little more straightforward for you. 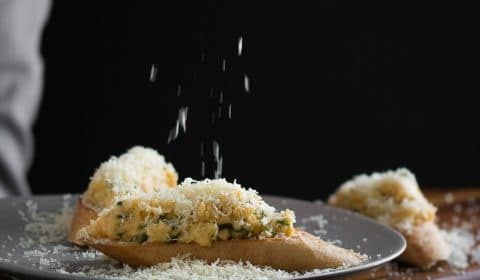 Add the fat slowly –So when making any emulsifying sauce (and if you want to know what I mean by emulsifying sauce, check out this 5-minute aioli recipe), it’s important to add whatever fat you’re using slowly as you whisk it through your egg mixture. If you were to add it very quickly, or all at once, the mixture will split. Meaning the fat and the egg content will separate and will not bind no matter how hard to try to whisk it. 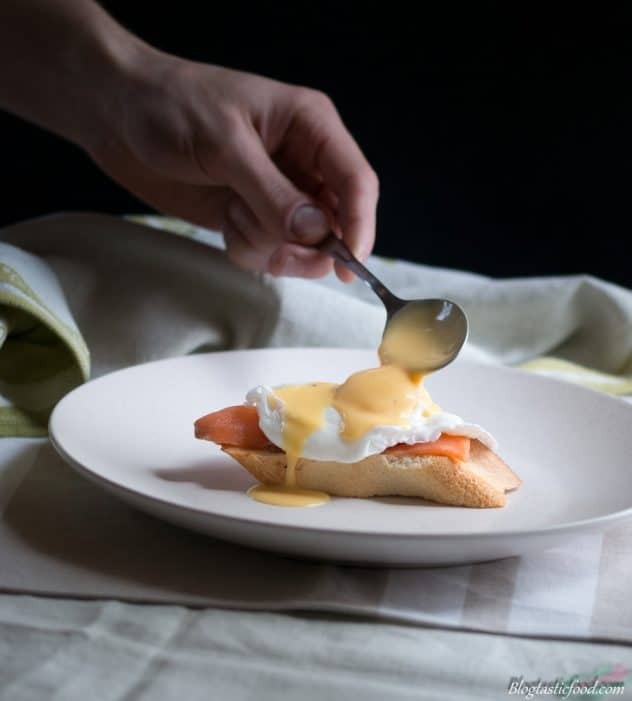 Take your time to make this hollandaise, and when you want to heat it up again, just gently heat it up over the water bath. It just needs to be warm, don’t overheat your hollandaise. The other components of the dish aren’t difficult at all. I am sure I don’t need to go into detail on how to toast bread or how to put salmon on top of that bread. 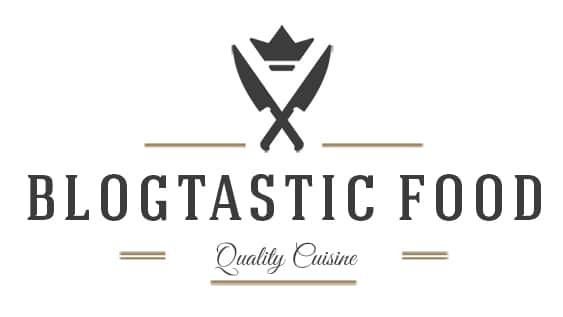 Before we move on to the recipe, I just wanted to thank you for taking the time to take a look at my blog. I really hope you got something out of this post. Feel free to follow me on social media, I am on Facebook, Pinterest, Twitter and Instagram. Other than that have a wonderful day and enjoy the recipe. 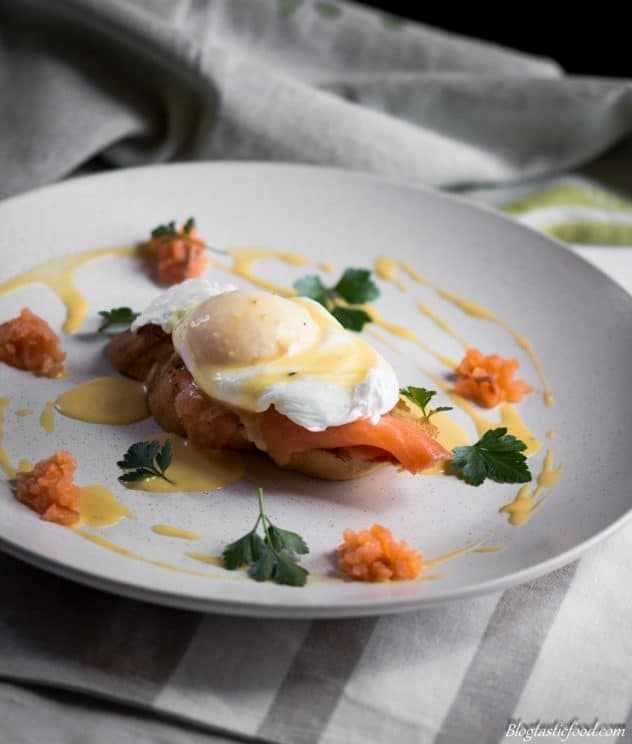 A slice of toasted french baguette with smoked salmon, poached egg and hollandaise sauce. Get a water bath on the stove (a pot of shallow, gently simmering water). Get a small pan or pot on the stove and melt the butter, once it's melted turn the heat off and set aside. Whisk your egg yolks and lemon juice together in a bowl. Place the bowl over the water bath but make sure the bowl doesn't touch the water. Continually whisk (if it feels like the bowl is getting too hot for the egg yolk, you can take it off the heat just to cool down a bit before putting it back on). Once the mixture starts to thicken, foam up and get pale take the bowl off the heat. Gradually add the melted butter to the egg yolk mixture whisking on each occasion. It's important that you add the melted butter bit by bit otherwise the mixture can easily split. You should now have a fairly thick mixture, so add the 2 tablespoons of water to loosen up the sauce, season with salt and pepper and give it a good 15-30 second whisk. Once you're happy with your hollandaise sauce set it aside. Toast the baguette slices on a pan, griddle pan or toaster. Place on a plate and give a nice drizzle of oil. Bring a pot of water to a gentle simmer ready to poach your egg and then add your vinegar. (pro tip: fill your kettle right up with water, once the water is boiled add it to your pot so now you don't have to wait 100 years to get your water to heat up). Next, just gently wave/layer your smoked salmon on your toasted baguettes. crack your egg in a small container or something similar (one at a time) first just to make sure there is no shell and that the yolk isn't broken. Then, add it to your simmering water. The eggs should take about 4-5 minutes to cook. As soon as your eggs are cooked, meaning that the egg is solid, doesn't break apart and you can see there is no raw egg white. Gently scoop out the eggs with a large spoon, drain the water and carefully place it on your baguettes. Spoon some of the hollandaise over your eggs and finish with a sprinkle of parsley. Make the hollandaise first, then just heat it up when you're ready to serve. Heat control is important when making hollandaise sauce, make the heat isn't too high when cooking and whisking the egg. 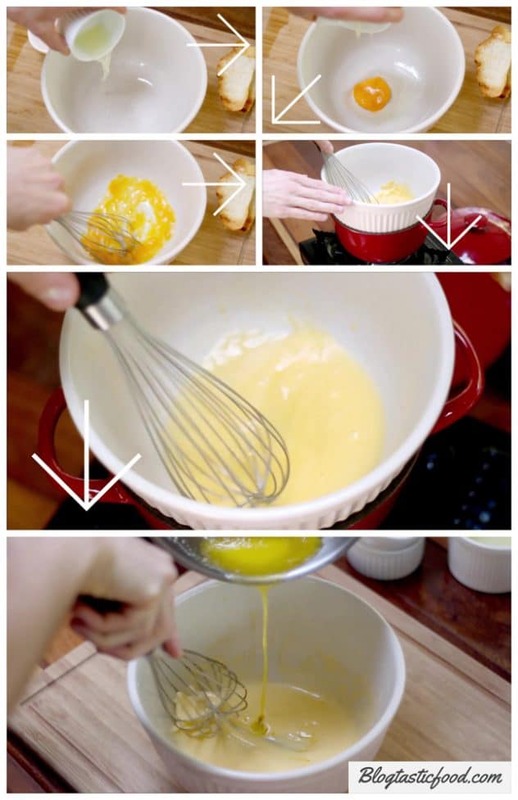 When adding the melted butter to the egg yolk mixture, add it SLOWLY as you whisk it through. Adding some vinegar to your simmering water will help stabilize the egg white as it poaches. When poaching eggs, try to use the freshest eggs possible. When you poach the egg, make sure the water is simmering gently. Rapid boiling water will break the egg. I see, that your page needs fresh and unique articles. Thanks you so much! I really appreciate that (: Your blog is also fantastic.